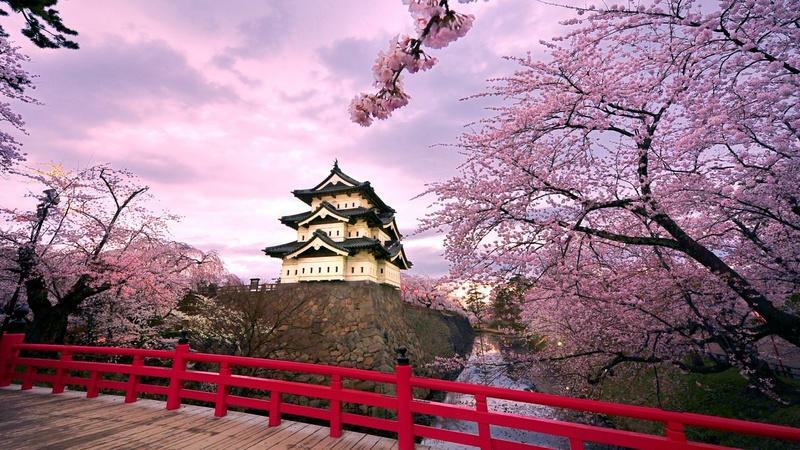 Hirosaki is a town a short distance from Aomori in the north of the island of Honshu, developed over the centuries around its castle, which has now become a historical monument of national importance. The oldest castle in the Tohoku region, together with several examples of ancient samurai houses and particular western-style architectures dating back to the early twentieth century make Hirosaki one of the most culturally interesting towns in northern Japan. The city is completely covered in snow in winter and is the main apple producer in the country. Hirosaki Park is considered one of the most beautiful places to see the cherry blossoms in spring (hanami). The park occupies an area of 49 hectares and has about 2600 cherry trees. A festival takes place every year in spring (see events). Inside the park there are the surviving or reconstructed buildings of the Hirosaki Castle, five long and large moats crossed by bridges, a botanical garden, a museum with local historical and artistic artifacts (Hirosaki City Museum), a shinto shrine (Gokoku shrine). More or less in the center of Hirosaki Park you can find Hirosaki Castle's main keep. The castle was completed in 1611, but the original 5-storey keep was destroyed just 16 years later (1627) after being struck by lightning. Rebuilt in 1810 on three floors, the present keep is the oldest in the Tohoku region and one of the few in the country that has not been rebuilt in the modern era. In addition to the keep, you can also find fortified moats, entrance gates, and some turrets (yagura) belonging to the ancient castle. A traditional Japanese style garden located a few meters southwest of Hirosaki Park. 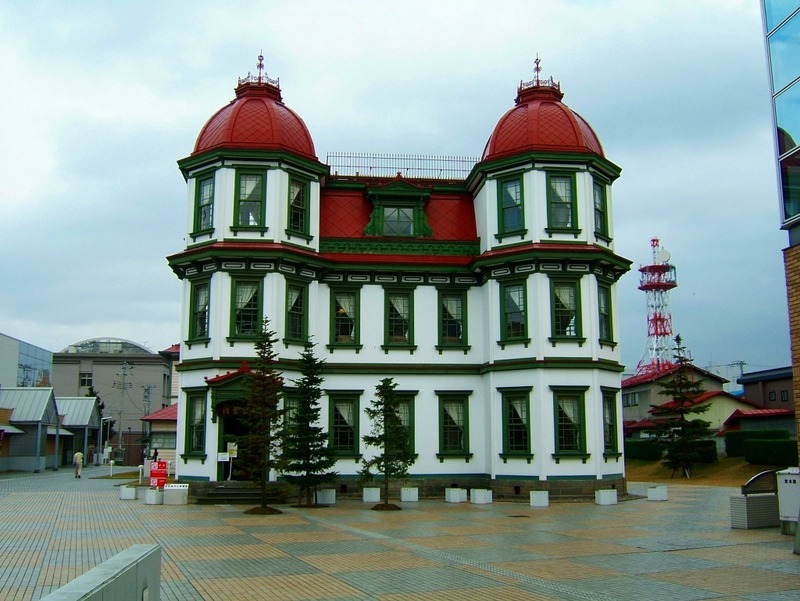 Built in 1919, it is named after its first owner, a prominent local businessman named Fujita Kenichi who was also the first president of the newly formed Japanese Chamber of Commerce (JCCI) in 1928. Inside the garden there are several small buildings: a traditional Japanese house, a Western-style house with a tea room inside, a tea ceremony building, a small archaeological museum. It is possible to find similar gardens everywhere in Japan, it is nothing special. With a 510 ¥ combo ticket, however, you can visit the castle's keep, this garden and the near botanical garden. At the time of feudal Japan, Hirosaki Castle was surrounded by the houses of various samurai loyal to the Tsugaru Clan, that dominated the region and used to live in the castle. Today almost everything has been destroyed, but some original buildings can still be found just north of the castle, in an area nicknamed Samurai District. However, this is not a preserved historical area (what you find for example in Kanazawa), but a common residential area. Here and there, among the normal buildings, you will find some residences that once belonged to samurai. Three of them are open to the public and can be visited free of charge (opening hours 10-16): the Ito Residence, the Umeda Residence and the Iwata Residence, a few meters from each other. Morover, a fourth building can be visited inside, the Ishiba Residence (admission 100 ¥, opening hours 9-17), that once belonged to a family of merchants, and still inhabited today. 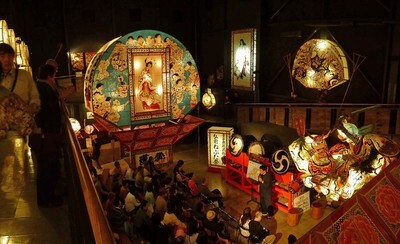 A museum dedicated to the local traditional festival, the Neputa matsuri which takes place every year during the first week of August, and to other small local traditions. The main exhibit of the museum is the floats used during the festival. With the help of the staff you can also try playing the taiko (Japanese drums used during matsuri festivals), and attend short performances of shamisen, a three-stringed Japanese musical instrument. A temple located in the central area of the city of Hirosaki. 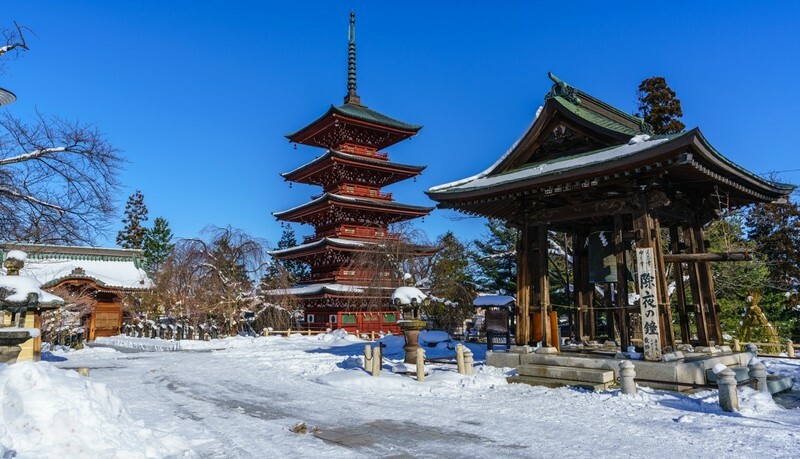 It is known for its five-story pagoda (31.2 meters high) built about 350 years ago, in 1667, to commemorate those who died during an important battle of the time. Someone says that it is "the most beautiful pagoda of the Tohoku". It is a fascinating temple to visit, with its impressive pagoda and several interesting sculptures around the temple buildings. Between the end of the nineteenth century and the beginning of the twentieth century the city opened up to foreign influence, thanks to the arrival of numerous western missionaries invited to teach English. In the same years numerous western-style buildings were built. Fortunately Hirosaki did not suffer air raids during the Second World War, so these historic buildings have survived to this day and are one of the city's most unexpected attractions. Here is a list of the most famous. Old Hirosaki City Library (旧弘前市立図書館), built in 1906 as a municipal library, it was used until 1931. 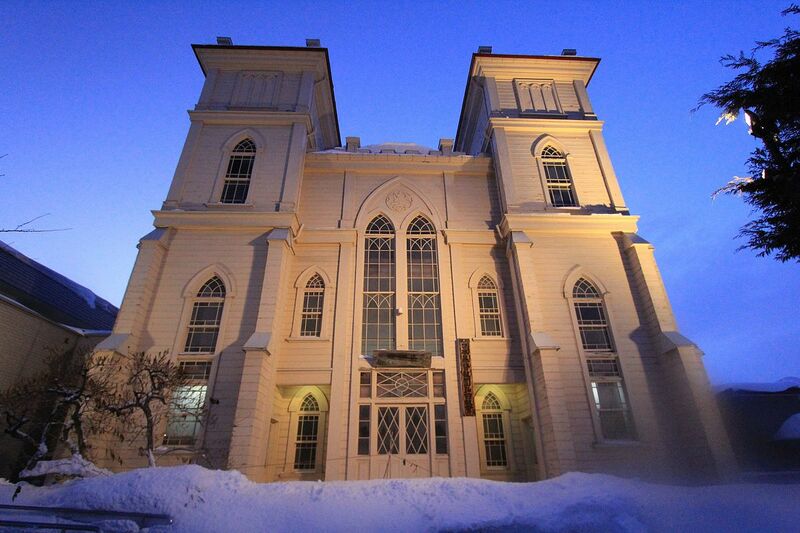 Hirosaki Gakuin Foreign Missionary Hall (弘前学院外人宣教師館), built in 1906 as a lodging house for American missionary women. Hirosaki Protestant Church (日本キリスト教団弘前教会), built in 1875, it was the first Protestant church in the Tohoku region and still in use. It is a miniature reproduction of the Notre Dame Cathedral of Paris, then in Gothic style. Toogijuku Missionary Residence (旧東奥義塾外人教師館), built in 1903 as a residence for foreign teachers (and their families) who came to teach at a private school in the city. Aomori Bank Memorial Hall (青森銀行記念館), built in 1879 to house a bank. Renaissance style. Hirosaki Catholic Church (カトリック弘前教会), built in 1910, the city's Catholic church and still in use. Romanesque style. Hirosaki Ascension Church (日本聖公会弘前昇天教会教会堂), built in 1920, the Anglican church of the city and still in use. Red brick architecture. (free admission) A huge park located outside the city with around 1300 apple trees. Here you will find several activities related to the production of apples, including a cider factory and a small museum. The park organizes various events throughout the year. For example, in may there is the Apple Blossom Festival. The most popular time to visit the park is the apple picking season (August-mid November), when you can go yourself picking your apples (around 200¥/kg). 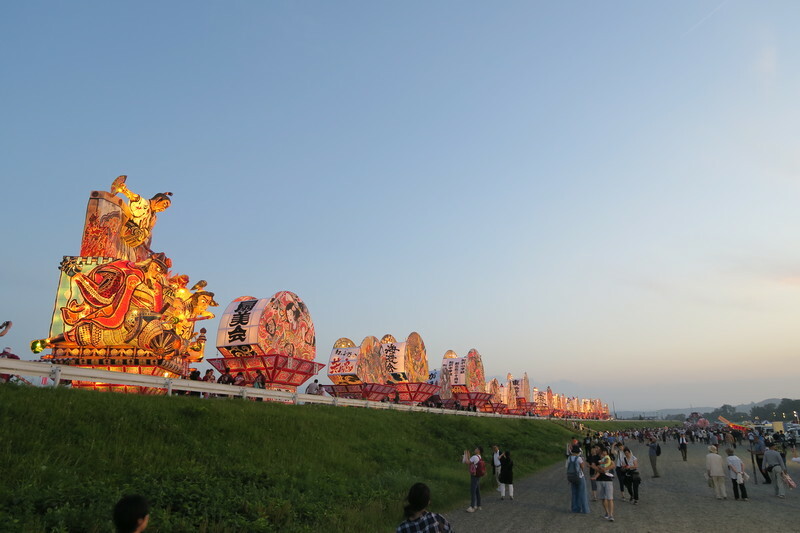 The Neputa festival of Hirosaki is usually overshadowed by the similar but more famous Nebuta Festival of Aomori. 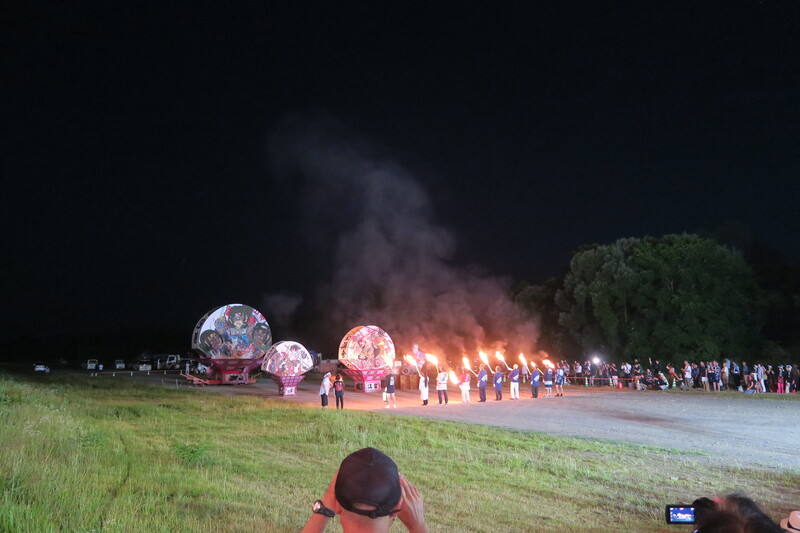 Still, Hirosaki's festival is very fascinating, with several events spread over a whole week. Great fan-shaped floats (and more) parade through the streets right after sunset, several times and in different places. 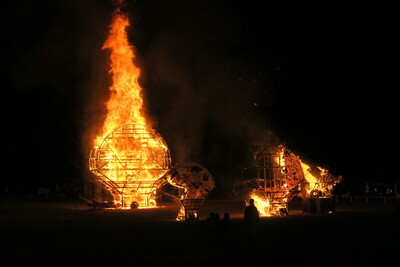 On the last evening the festival moves on the banks of the Iwaki river where some floats are burned by a bonfire. Practical information on the current next edition of the festival can be found on the Hirosaki Tourism and Convention Bureau website. In winter, the city of Hirosaki is constantly covered with snow. 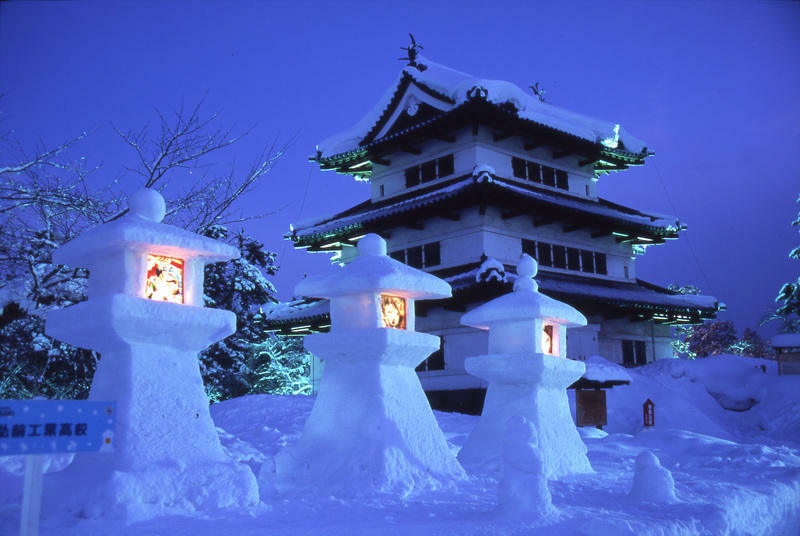 Around mid-February, hundreds of traditional-style Japanese lanterns and other sculptures are made with snow by the locals throughout the area of the Castle Park, inaugurating the Yuki-Doro Matsuri (弘前雪灯篭まつり, "snow lantern festival"). At dusk, with the special illumination throughout the park, the lanterns lit inside, and the snow-covered castle, the atmosphere becomes incredibly magical. 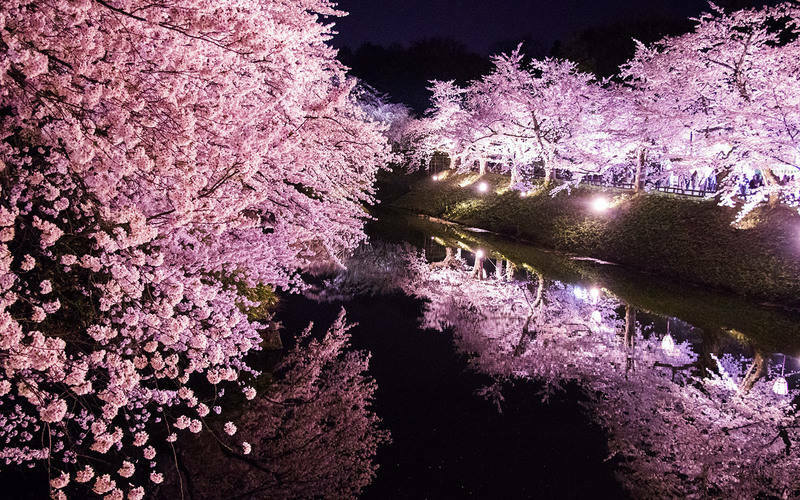 With its 2600 cherry trees, some of which are centenarians, and more than 50 different varieties, Hirosaki Park is one of the best places in the Tohoku region and Japan where to enjoy the cherry blossom in the spring. The cherry trees in this park are unique because each branch produces more flowers than usual thanks to a special pruning technique derived from that used for apple trees in the region. During the Sakura Festival, the castle's opening hours are extended until night and the whole park is illuminated in a special way creating a very romantic atmosphere. The park also gets full of food stalls. Throughout the day the park is full of people picnicking under the pink trees. If you also want to take part in a group picnic, the park institution offers this service to tourists. 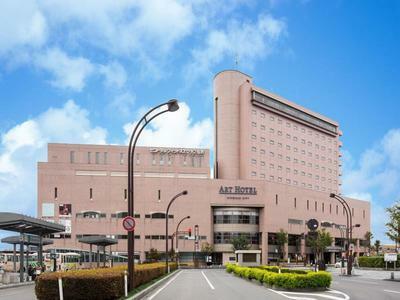 This hotel is located along one of the main shopping streets of the city, about 1 km from Hirosaki station and 700 meters from the Castle Park, that you can reach and explore also by bike! This hotels also provides a free bicycle rental service to all guests. Small and simple rooms but equipped with all basic comforts. If you are looking for a budget hotel, this is one of the business hotels with the lowest prices in the city. 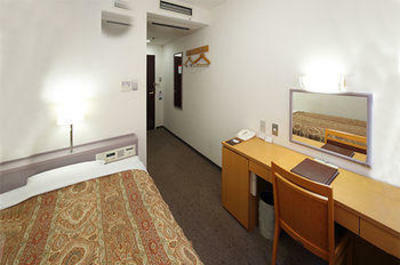 Dormy Inn hotels are always recommended by youinjapan.net in any city in Japan. This branch is located about 500 meters from the Castle Park and just minutes from many other attractions and the central streets of Hirosaki. On the top floor there is a beautiful onsen with sauna and also an outdoor bath (in the picture on the right). The station is not very close (1.6 km) but the hotel offers a free shuttle service. Late evening free ramen for all guests. Modern and elegant rooms. This hotel is located opposite Hirosaki Station and the bus station. This is a huge hotel with many types of rooms, furnished in a modern and sophisticated style. If you ask, you could get a room on the top floors with a decent view of the city. Inside the structure there is also a restaurant, a tea room, a lounge bar, a fitness center with swimming pool (with an entrance fee), and some shops. The fares of this hotel are higher than average in the city but it is difficult to pay less in the immediate vicinity of the station. If you want to sleep next to Hirosaki station this is the best value for money. 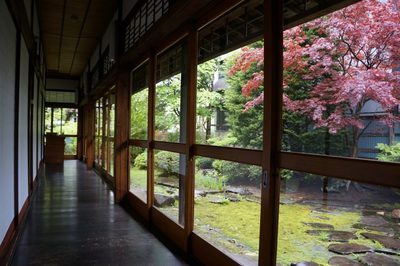 A delightful family-run ryokan in a traditional 150-year-old wooden building (opened in 1879), with a small internal garden. Walking through the corridors of this ryokan is like traveling through time. 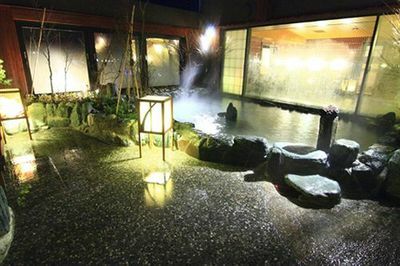 The ryokan is just a few meters from the Hirosaki Castle Park. All rooms are Japanese-style with tatami mats and futons. On request, it is possible to have breakfast and/or dinner on site with seasonal local products and kaiseki dishes. The owner is a very kind person and is often available for a free ride to the station or to offer you an apple liqueur in a pub next to the ryokan. The main attractions of Hirosaki are located in the area between JR Hirosaki station and Hirosaki Park, about 2 km from each other. The city can easily be explored on foot, but not everyone loves walking and especially in winter it could be difficult due to the cold and the snow. You can take a taxi or use the city loop bus. A loop bus line that connects Hirosaki station to Hirosaki Park with several intermediate stops. Map and details here. Another useful map here. Hirosaki station is a station along the Ou Main line, a line connecting Aomori and Akita, and that then continues to the south. You can get to Hirosaki by train directly from Akita (160 minuties) and from Aomori (40 minutes). For those coming from Tokyo, Sendai, Osaka (etc. ), the most common way is to get to Aomori first (served both by shinkansen trains and a local airport), and then getting a train to Hirosaki along the Ou Main line. There is a train every 50-60 minutes. More information on how to get to Aomori. A tourist train between Akita and Aomori (stopping in Hirosaki too), which partly uses the Ou Main line and partly the Gono Line. The route of this line is often just a few meters from the sea. 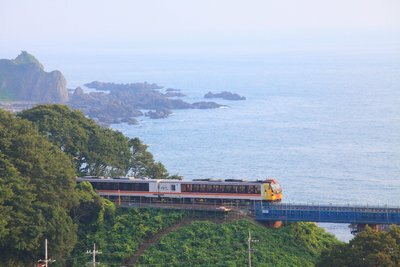 From this train you can enjoy very beautiful views of the coast on one side, mountains and forests on the other. This line runs practically at the foot of Shirakami Sanchi, a mountainous area covered by the last virgin beech forest left in Japan and for this reason included in the UNESCO World Heritage Sites. This train is not conceived merely as a transportation service, but as a tourist attraction. All seats are reserved, they're wide and comfortable, the windows are very large to ensure a good view, and the train slows down every time it is crossing a scenic area. This train is generally not operating every day, except during the summer season. More information and possibility to book on the JR East website .